An Alcoholics Anonymous General Service Area is a geographical division. There are 93 areas in the United States and Canada. Each area is represented by an elected delegate at the General Service Conference held annually in New York, home of the General Service Office (GSO). Area 37 by district. Click or tap to enlarge. 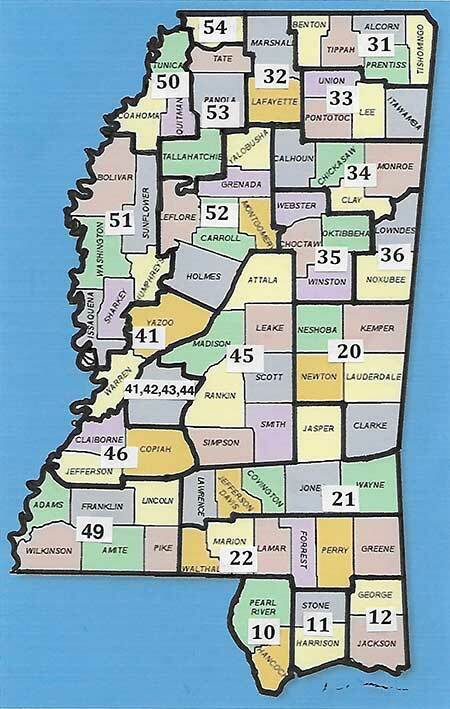 The State of Mississippi is a single General Service Area named Alcoholics Anonymous Area 37. It has about 4,500 A.A. members in more than 200 groups in its 24 districts. The Mississippi map shown on this page is Area 37. It is divided by districts marked in large numerals with white backgrounds. Originally there were only five districts in Area 37. These have been expanded with the original lines kept as zones 1 through 5. In assembly, reports are heard, area affairs are discussed and business conducted. There are four assemblies per year. All A.A. members are welcome, but only those elected or appointed as DCMs, GSRs, Officers/Alternate Officers, past Delegates, and Area Standing Committee Chairs may cast a vote. While our cities have their intergroups, central offices and answering services, there are many small town groups in Area 37. Most meetings are listed here in our directory.